Brahmatal Trek in Uttarakhand under crisp blue skies, surrounded by the snow-capped mountains is absolutely spectacular. Explore best holidays in the Himalayas and discover the beautiful attractions of Brahmatal Trek in Uttarakhand. With many mesmerizing sights around, there is always something with these winter Himalayan treks. Adding the beauty of this amazing winter trekking in India are the Trails, Beautiful Views and Campsites. Himalayan trekking on the bed of snow with natural beauty is an opportunity to enjoy the winter trekking in the mountains of Uttarakhand. Brahmatal Trek in Uttarakhand, a majestic peak where Lord Brahma meditated according to the mythology. One may see the astounding views of pointed snow-covered peaks of Mt. Trishul, Nanda Ghunti and the close view of the jatropani peak, Kamet (second highest peak of Garhwal) with the naked eyes. One may spot the numerous stars and galaxies that are never visible from the city. Distance:210 km (10 hrs drive). The vehicles start at 06:30 am from the parking of Kathgodham railway station. 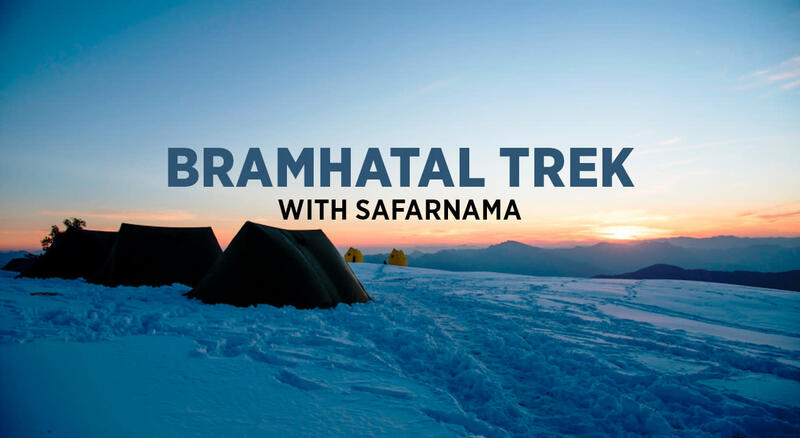 Brahmatal Trek in Uttarakhand begins at Basecamp Lohajung which is 8-9 hours journey from Dehradun through scenic winding roads of Kumaon and Garhwal region. The route is almost always foggy or misty and goes through the vegetation of coniferous forest. The long serpentine road is full of curves and bends hence it is advisable to carry motion sickness pills if you frequently require them. The roads are generally bumpy and the journey is cold. Lohajung basecamp of Brahmatal Trek in Uttarakhand is a small hamlet nestled in the laps of the Himalayas, surrounded by the rhododendron, oak and pine forest. This place is developing offbeat packages for trekkers including the stay in the mud and stone built houses. It offers spectacular views of the Mountains such as Mt. Trishul and Mt. Nanda Ghunti. Woollens are advised to be kept in handy. The night is spent in guest houses or lodges available nearby. Trek gradient: Moderate; gradually ascending through forest vegetation. Trails are distinct. Water sources: The first source would be found about 2.5- 3 hours into the trek. The next spot would be where we stop for lunch. The trek starts from lohajung as we move upwards from Bisht General Stores. The trail is a welldefined human-made stone trail. Walk through the upper region of Lohajung and then through the forest trail with a few more houses. After a quick trek, one can spot the Mandoli village to their left, eventually the Kail valley, where the river Kail and Pindari meet, and then the village Budla. After trekking for 2 hours we reach Begum. Another hour and a half and we reach a stream called Gujrani. From here we trek to Bekaltal, which would take 1 hour 15 minutes. Camp near the lake for the night. followed by a gradual descent to the Brahmatal base. Water sources: None. Must carry at least 2 ltrs of water from the camp. Bekhal Tal, the campsite of the Brahmatal trek in Uttarakhand is a opportunity for your inner photographers where you can capture the classic frozen lake, snow peaks and some gorgeous beauties that offers thrilling climbing adventure to take you breath away. Fresh snow on the trail, the view from Bekhal Tal is captivating. During winter trekking in India, the beautiful Bekhal Tal remains frozen with the layer of snow and the beauty of the surroundings is unmatched. This lake is dedicated to Lord Nag Devta. There is a small temple of Nag Devta temple located 8km from Lohajung, every year local residents collect here and decorate the temple beautifully on the occasion of Nagpanchmi. Wake up to some tea, breakfast and a steep ascent into the Oak and Rhododendron forest. Walk under the constant view of the Trishula and the Nanda Gomti peaks. After an hour of ascent, the trail takes you a Jhandi Dhar campsite of the Brahmatal trek in Uttarakhand on a surreal look with the fresh white snow and picturesque view of the trees also enhance the beauty of the area during winter Himalyan treks. The route mostly passes through the thick forest of cedar, oak and fir. Trekkers also see the splendid beauty of the Green meadows, Icy mountains, Snowy Plains and a wide variety of flora and fauna. Jhandi Dhar is a must visit place for adventure lovers and Bird watcher. After an hour of ascent, the trail reaches a meadow. We then proceed to the final point for the day, Brahmatal base. We camp in the vicinity of the lake. Water sources: None. Must carry at least 2 ltrs of water from the camp. Wake up and walk to a sight to behold. Proceed to a strenuous walk to the khamila Top. Khamila Top, is the highest point of the Brahmatal trek in Uttarakhand and certainly one of the most stunning attractions of tourist. The beautiful natural scenic place is at a height of 12,000 feet above sea level and is blessed with the best flora and faunas. The perfect place for adventure lovers. One of the few attractions known for the 360-degree view of the Himalyan Ranges like Neelkanth, Mt. Trishul, Chaukhamba, Maitoli peaks, Hathi parvat, Ghoda parvat, Neelkanth and Nanda Ghunti. Trek gradient: Difficult, long descent Water sources: Near a hamlet, about 4- 4.5 hours into the trek. Head out to Daldum and Malling and eventually reach Buralli. From here a stone path leads to Lohajung. 1. From Delhi- Overnight Journey –Train- Ranikhet Express Depart from Delhi at 10:40 pm reached Kathgodam at 5:00am or the Uttar sampark kranti -from Delhi at 4:00 pm arrival Kathgodam at 10:40pm for more detail visit IRCTC web site. 2. From Dehardun- Doon Express – Dehardun at 10:30 pm reached Kathgodam at 7:10 pm. Kathgodam to Lohajung to Bekaltal- Bekaltal to Khabekhal (or Brahmatal)-Khabekhal to Daldum via Brahmatal Peak -Daldum to Lohajung to Kathgodam Famous hill station located this route- Nainital, Almora, Kausani, Baijnath and Gwaldam.